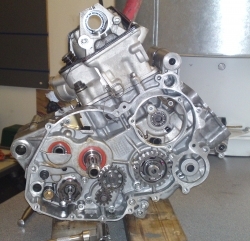 To get the very best performance from your motorcycle, JB Motorcycle Services also offer a range of engine and performance tuning services. Call us for a quote to maximise your potential! Have you fitted an aftermarket exhaust or decat?. Would you like improved throttle response?. Does your bike run lumpy on idle?. Does the bike suffer from a jerky throttle response?. Would you like improved MPG?. If you answer yes to any of the above questions then your motorcycle will benefit from a custom fuelling map. At JB's we have the software to live remap your ECU directly on most Suzuki models on a dyno without the need for an aftermarket fueling controller. 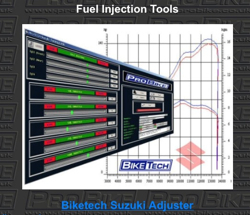 On models which run primary and secondary injectors (most GSXR's and Hayabusa's) mapping direct to the ecu means that we can control the fueling to all eight injectors unlike using a PC3 or PC5 which only connects to the primary injectors unless you purchase a secondary fueling unit. This gives a cleaner and more responsive fueling map, removes glitches in the throttle response and thus creates more horsepower and torque. Jerky throttle response is often mis diagnosed as incorrect TPS settings. More commonly it is due to poor fueling setup at small throttle openings. Even motorcycles with a standard exhaust can benefit from a custom map. No two identical motorcycles will fuel the same due to tolerances within the fuel injector flow rate and engine and the factory installed maps are a generic map and therefore dont take the variance in tolerances into account. Some exhaust manufacturers will inform you that your fueling wont require any alterations when fitting one of their exhausts, but from experience there are always improvements to be made. If your spending £500 on an exhaust then its worth spending a little more to get your bike fuelling and responding as best it can. I will spend around 3 hours on the dyno constantly monitoring the air fuel ratio and remapping each individual throttle position over 5 positions in each gear. We do not ever use downloaded maps.